Congratulations to the winners – and thank you for all of your submissions! They had us in stitches! Part comedy routine, part real-talk, all entertaining – Tom used his artistic talents and clever sense of humor to get us to rethink the way we adopt new martech, overcome fear, and drive transformation at our companies. 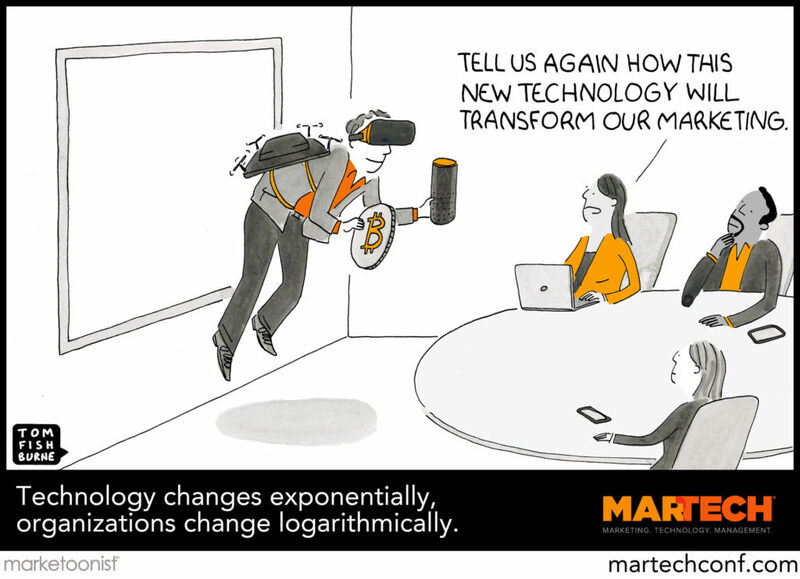 One of the highlights of Tom’s keynote was the unveiling of his newest cartoon, complete with an official caption that came directly from the MarTech community. You may recall a few months ago, we held a caption contest to generate ideas for how to complete this cartoon… and boy, oh boy, were we blown away by what you had to share. You can read all of the entries here! Congratulations to the winners and a big thank you to everyone who submitted a caption! We absolutely loved your creative contributions! MarTech is returning to the East coast later this year. Join us September 16-18 in Boston for three amazing days of learning and networking with a thriving community of senior-level marketers. The site is up and registration is open… now is the time to lock in best rates!